I purchased a refurbished Impulse 25 online through Focusrite.The packaging was superb for the long travel and it arrived right on time. I did have some troubles getting the keyboard setup under Windows 10 with a USB connection (the legacy midi worked fine) but I contacted Technical Support (chat) that evening and the tech support agent had me up and running in Live in no time at all. I'm continuing to be very impressed by Novation. And what impressed about the Impulse 25 is the fact that it has the legacy midi In & Out connections which is hard to find in a USB-centric controller keyboard world. Love the semi weighted keys that almost feel like your playing a piano again which is very comfortable. Haven't used it that much quite yet but I have a feeling I'm going to love it more than the previous USB midi keyboard I originally had. intuitive controls, nicely weighted keys, compact, light and infinitely programmable, this model with octave shift. Novation's ultra-responsive, highly expressive 25-key MIDI keyboard hosts a comprehensive array of fully assignable controls, integrates seamlessly with Ableton Live, Apple Logic Pro, Avid Pro Tools and other major music software, and is built to be a true player's instrument. 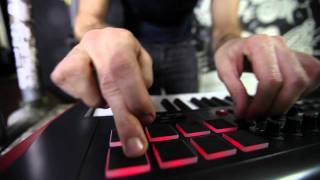 In designing Impulse 25, Novation went all-out to create a supremely expressive performance keyboard. Ultra-responsive with semi-weighted action and aftertouch, its full-size piano style keys adapt beautifully to virtual organs, synths and pianos. Novation's High Rate Scan (HRS) technology 'reads' the keyboard 10,000 times per second, capturing every nuance and detail of your performance to an incredible degree of precision. Take control of your mix and sculpt your sounds with Impulse 25's endless smooth-action knobs, low-profile 45mm faders, plentiful buttons and LCD screen. Each control can be manually mapped to any DAW or plug-in parameter via MIDI, or automatically assigned using Novation's famous Automap software. Impulse 25's eight pressure-sensitive, backlit pads are perfect for playing and recording drum and percussion tracks, with Roll mode making light work of automatic note repeats. Going beyond beats, Arp mode uses the pads for real-time arpeggio design, while in Ableton Live, they can even be assigned as multi-coloured clip launchers – yellow for a loaded clip, green for a playing clip, or red for a recording clip. Being class-compliant and USB bus-powered, Impulse 25 only has to be plugged into a Mac or PC to get up and running – no power supply required. It's gig-ready, too, with a 5-pin DIN MIDI Out port enabling connection to hardware synths and sound modules. Impulse 25 also ships with a massive library of Loopmasters samples, as well as the Bass Station plug-in, which brings the sound and vibe of Novation's legendary analogue bass synthesiser to your VST/AU-enabled DAW. As well as Ableton Live, Impulse 25 integrates with Logic Pro, Cubase, Reason, Sonar, Pro Tools and other major music production applications, and is compatible with Novation Automap for instant and automatic DAW, instrument and effect plug-in control. Manipulate your sounds and mixes using Impulse 25's endless smooth-action knobs, low-profile faders and assignable buttons, with feedback provided by the LCD display. Fully class compliant and USB bus-powered, Impulse 25 'just works' with Mac OS X and Windows, requiring no power supply or drivers.